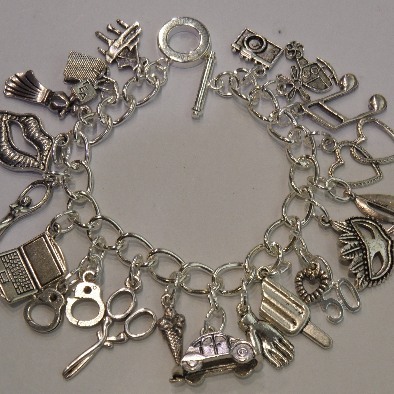 50 Shades of Grey Loaded Charm Bracelet. Piano, Tea bag, Dress, Smart Mouth, Inner goddess, Computer, Handcuffs, Scissors, Ice cream cone, Beetle car, Twitchy palm, Popsicle, 50, heart, mask, Sailing Boat, Entwined hearts, Music Note, Charlie Tango helicopter, and a Camera. You can now choose to have a sterling silver chain. This bracelet will have more charms and look slightly different as there are more links to fill.